I'm really loving Lush at the moment. I tend to get like this around this time every year when their Christmas offering never fails to put me in the festive spirit. Having said this, today's product review isn't from their Christmas range but is a new introduction. Step forward Friends with Benefits Massage Bar. I've never tried a Lush Massage Bar before. I don't really go in for home massage and frankly, there's just so many other products I'd choose to spend my money on ahead of a massage bar, oil or gel but seeing as I was sent Friends with Benefits Massage Bar, I figured I'd give it a go. The idea behind the Lush Massage Bars is that they are a solid, environmentally conscious, preservative and packaging free alternative to oils in a bottle. I really like this sentiment. It's innovative and stays true to the Lush brand. The bar itself resembles a soap in appearance and has a pretty raised floral design on the top. The bumpiness of the design means that it doubles up as a clever massage tool to really work into deep knots. The scent is absolutely incredible- a tempting chocolate orange that's practically good enough to eat. If you did want to choose one of these as a Christmas gift, it's a nice twist on the traditional Terry's Chocolate Orange stocking filler! 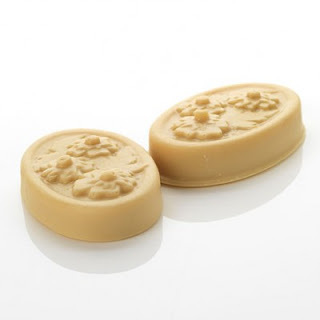 Made with a base of organic, fair trade cocoa butter and shea butter, the massage bar melts upon contact with warm skin to leave a lubricant layer which encourages massage. As it heated up, I found it very slippery and difficult to handle although perhaps this would be easier if someone else was applying it to you. Friends with Benefits Massage Bar contains chocolate-scented tagetes essential oil from African Marigolds which boasts skin soothing and healing benefits, making it ideal for use this time of year when skin is dried out. It's incredibly moisturising and I'd happily use this as a change from my everyday lotion on occasions when my skin needs an extra boost or simply if I want an indulgent treat! You only need to gently sweep the bar over skin and a layer of moisturising residue remains so I think that the bar would last a long time. If you're thinking of investing, I'd definitely recommend buying one of the massage bar tins to keep it in good condition. I'm all for the idea behind the paper wrapping and I like the old-fashioned feel of it but in a busy bathroom, a tin is infinitely more practical. Friends with Benefits Massage Bar definitely feels more like a sensual treat so if you're looking for a deep muscle soother, I'd say there are better products out there for the job. At £6.50 for 65g, I probably wouldn't repurchase this for the same reasons that I wouldn't have tried it in the first place if it hadn't been sent to me. It's good and I enjoyed using it but I simply don't use massage products. However, if you do, I'd definitely recommend checking this out.